Pentax Optio S5n introduction : Pentax introduces the new Pentax Optio S5n, a stylish and compact digital camera with ultra-compact, lightweight appeal. What's more, it also offers the power of 5.0 effective Megapixels and a 3X optical zoom lens incorporating Pentax's unique Sliding Lens System. Developed in line with the Optio S series concept of being "stylish and ultra-compact to enable it to be worn like an accessory", there's so much more to the Pentax S5n than its stylish, elegant appearance. 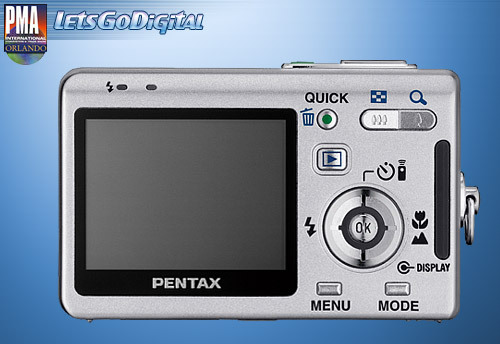 Indeed with an easy-to-see 2.0-inch large LCD monitor, a useful Mode Palette function that simplifies shooting and playback and the advantage of MPEG-4 file format for high-quality, extended duration movies, the Pentax Optio S5n is every bit as versatile as it is attractive. Stylish, ultra-compact body: A high-precision spindle effect of fine engraving has been applied to the silver surface of the Pentax Optio S5n's high-quality aluminium body. This achieves a texture that exudes sophistication and catches the light, while each of the four corners has been carefully rounded to impart a sense of softness. Handling is further improved through the use of rubber material on the back and strategic design elements on the front that lead to a more confident grip. The Pentax S5n is also highly compact: In fact, through making use of the unique Sliding Lens System, the Pentax Optio S5n features a powerful 3X optical zoom lens, yet retains ultra-compact dimensions of just 83 (W) x 52 (H) x 20.5 (D)mm and has a light weight of just 105 grams. With such sophisticated looks and conveniently small dimensions, the Pentax Optio S5n is ideal not only for travelling, leisure and everyday shooting, but also for various business purposes too. Large, easy-to-view 2.0-inch LCD monitor: Despite its ultra-compact body, the Pentax S5n incorporates a large 2.0-inch, TFT LCD monitor, the biggest in the popular Optio S series. It offers an approximate 100% field of view with the clarity of approximately 110,000 pixels, making it easy to confirm composition at the time of shooting and displaying images with high quality during playback. Extremely easy Mode Palette: Selection of both shooting and playback modes simply couldn't be any easier. Using the Mode Palette that displays 16 shooting icons and 11 playback icons on the monitor at once, the user is free to simply choose the one best suited to the scene at hand. Furthermore, the palette itself is also translucent, so the icons are displayed directly over the desired image for even easier mode selection. Quick button customizes desired functions: The user has the freedom to assign up to three functions to the handy Quick button for fast access. When the user assign the "Fn Setting" to the Quick button, it provides a shortcut to four items out of a total of 11 choices. Alternatively, the user can enjoy the convenience of leaving the Quick button at its default setting, Green mode, which leaves all settings to the camera for a fully automatic shooting. High image quality: A number of factors converge in the Pentax S5n to achieve satisfyingly high image quality. A 1/2.5-inch primary color CCD with the power of 5.25 total Megapixels captures intricate detail with excellent resolution. An smc Pentax lens delivers high-clarity by suppressing ghosting and flare. Furthermore, the Pentax Optio S5n also incorporates a new ASIC (Area Specific Integrated Circuit) to provide strengthened image processing performance, while noise reduction has been taken to a superior level. As a result of all these advantages, the Pentax Optio S5n combines clarity and true-to-life color gradations with meticulous color compensation. 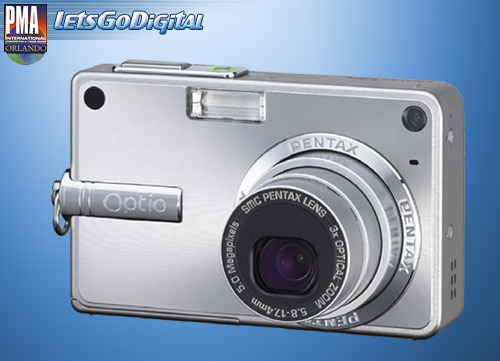 Movie shooting with in-camera editing: Offering movie shooting with 640x480 recording pixels at the smooth rate of 30fps (frames per second), the Pentax Optio S5n delivers movie quality comparable to a television image. The Pentax S5n is also a first in the Optio S series in that it offers the new advantage of an MPEG-4 image compression system. In comparison to the conventional AVI (motion JPEG) system, the MPEG-4 recording format enables the user to record longer movies on the same memory card. The user can also conduct various editing tasks in-camera following shooting, such as "Save as still image," "Divide" and "Cut and stitch". Handy camera stand charges batteries still in the camera and spares at the same time: The camera stand charges batteries while they are inside the camera. Furthermore, it has space for spare batteries too, which begin charging as soon as the ones inside the camera are fully charged. 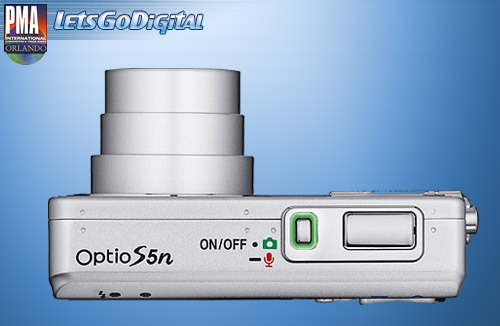 The Pentax Optio S5n also offers the additional convenience of being compatible with different voltages ranging from 100V to 240V (50/60Hz), enabling users to take it along on travels and recharge it virtually anywhere in the world.